Ever wonder how to make chalkboard signs or mini chalkboard signs? It’s easy using our chalkboard stencils and these Chalk Couture surfaces or other chalkboard material. Learn how to use what we think is the best chalk paint. 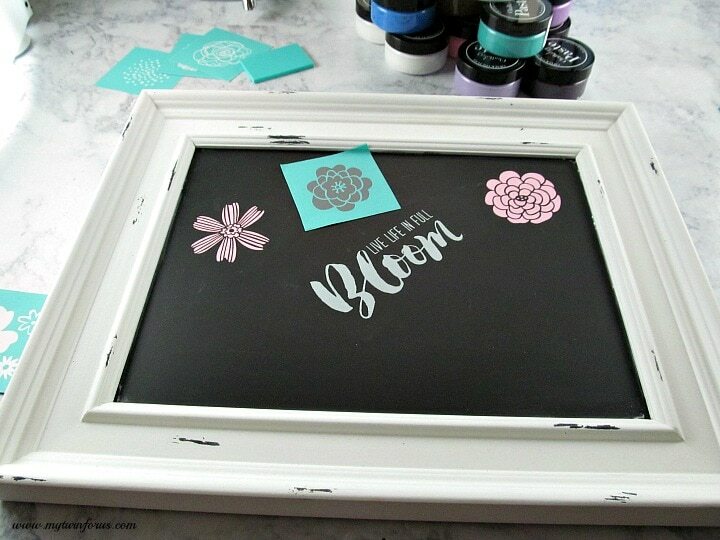 Do you wish to decorate with those cute chalkboard signs using cool chalkboard stencils? I know I always do, but I am sometimes very crafty challenged. If it’s not simple and easy, then I’m not doing it. After gathering your supplies, follow the steps below to make these simple Chalk projects in just minutes. 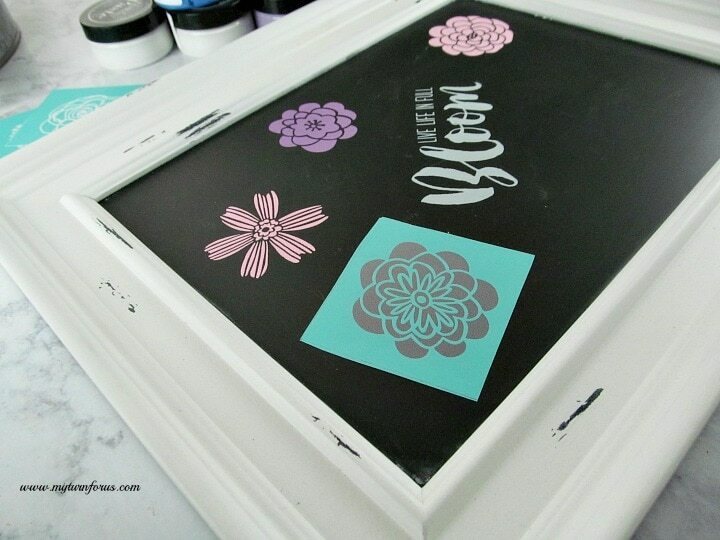 The only hard part is choosing which chalkboard stencil and which color or gorgeous chalk paste to use. 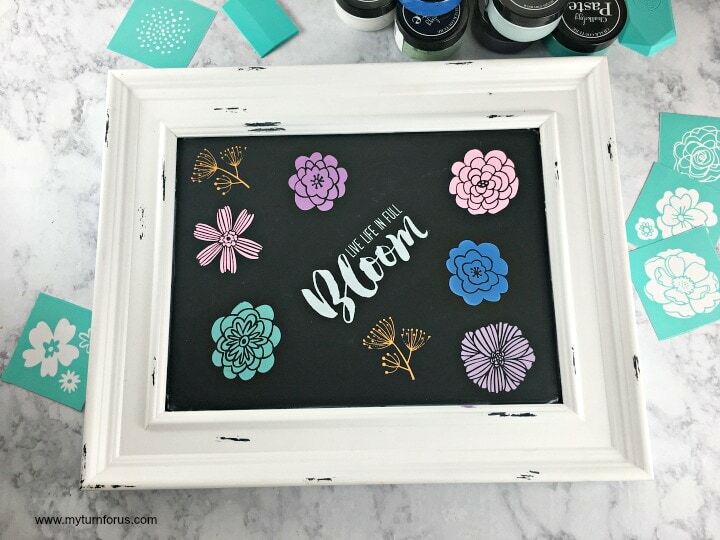 Let’s start at the beginning, and we will show you how to make a simple flower for mini chalkboard signs. 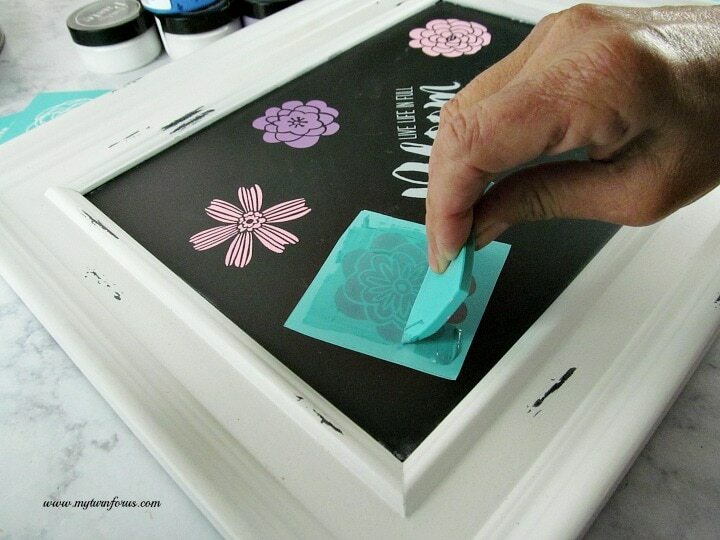 These Chalk stencils or transfers are adhesive silkscreens and unlike any other stencils. They are reusable, just wash them and wipe clean with sanitary wipes after easy use. The aqua colored stencils are sticky on the back and adhere very well to just about any surface. Always Always “fuzz them” prior to use. Stick the stencil on a fuzzy hand towel a couple of times after removing them from the backing to “fuzz” them. This procedure still enables them to stick. But it prevents them from bonding too strongly to the surface and then ruining the stencil. 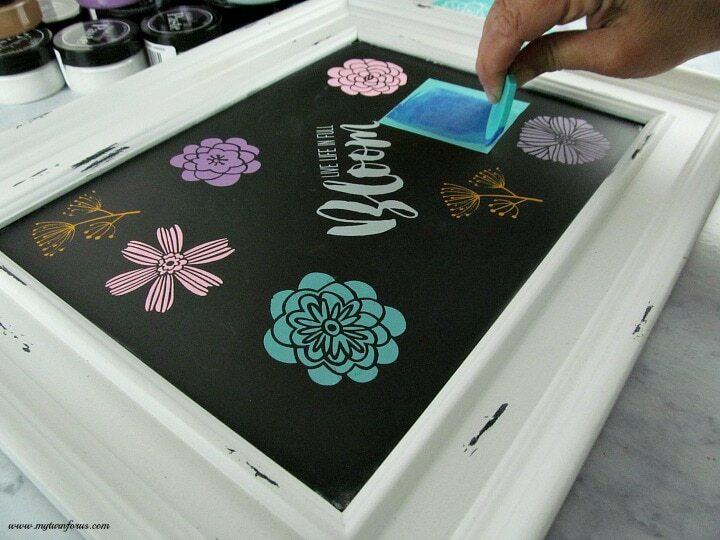 Cut out the stencil and “fuzz” it and then adhere it to the chalkboard surface pressing down securely. 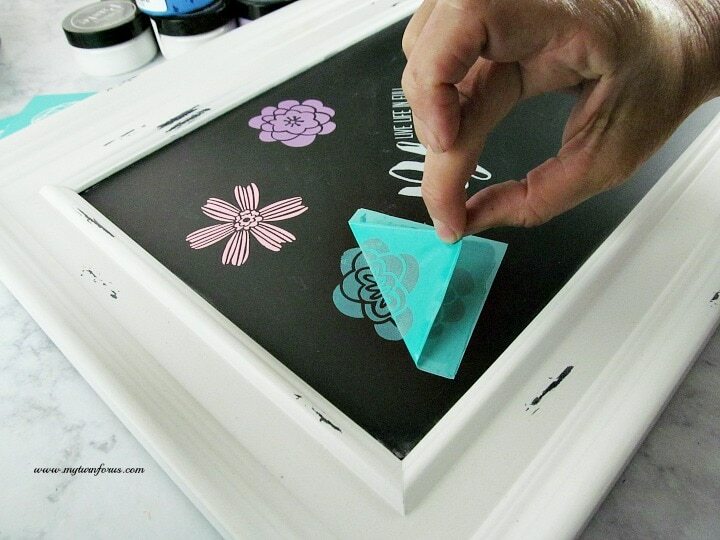 Drag the angled side of the squeegee across the entire stencil completely covering the design with the chalk paste. If you use too much paste then simply scrape off the excess and return it to the jar. 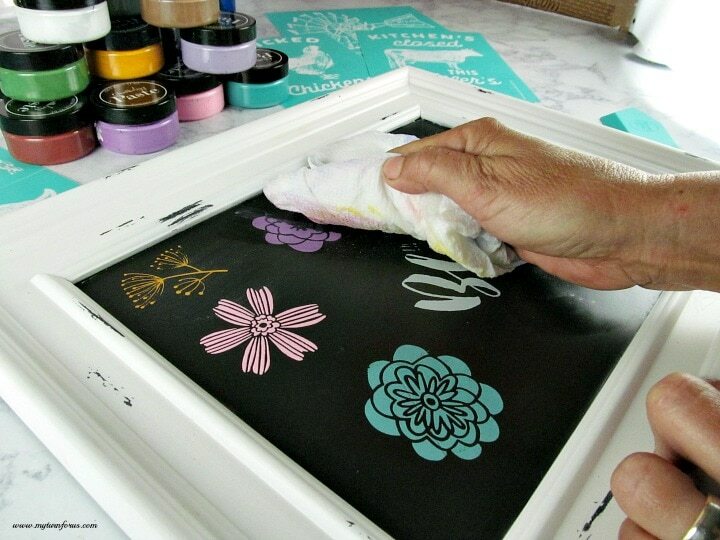 Remove the Chalk Couture stencil immediately while it is still wet because the paste dries quickly. Gently pick up from one corner and pull to remove, being careful not to touch the new design. Wash the chalkboard stencil immediately until no signs of paste remain. 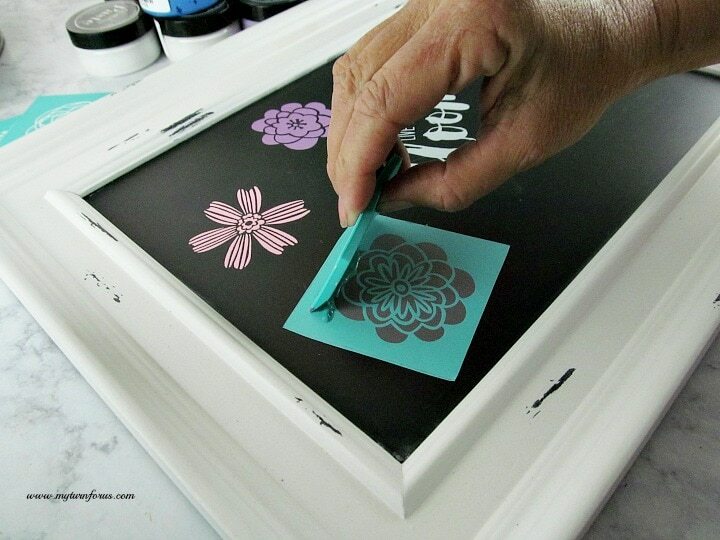 Then wipe both sides of the stencil with a disinfecting wipe to remove any chalk paste residue. Lay it on a flat surface with the sticky side up to dry. After it is dry replace it on the shiny side of the paper backer and smooth with a squeegee. Continue these same steps for the rest of your designs. This chalk paste dries quickly, so it’s easy to add additional colors and designs immediately. Now, don’t you agree that this is the best chalk paint ever? 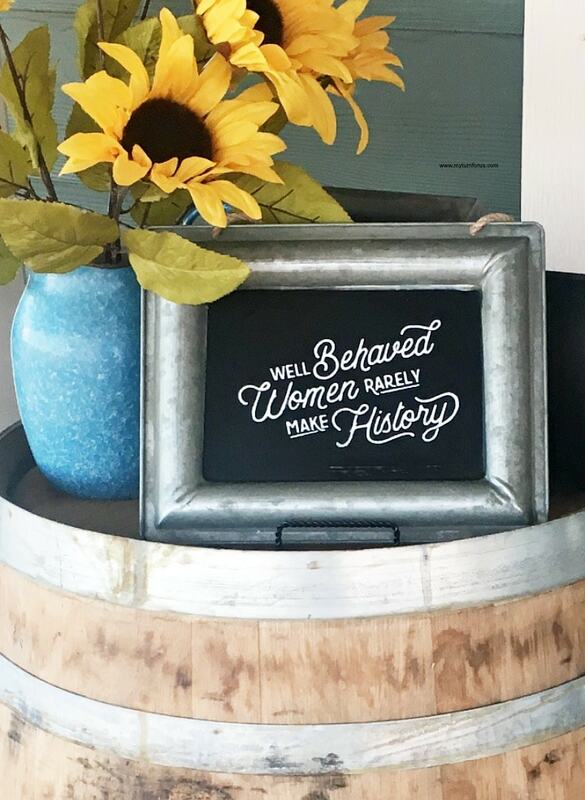 In no time at all, I can make the cutest chalkboard signs that are flawless. 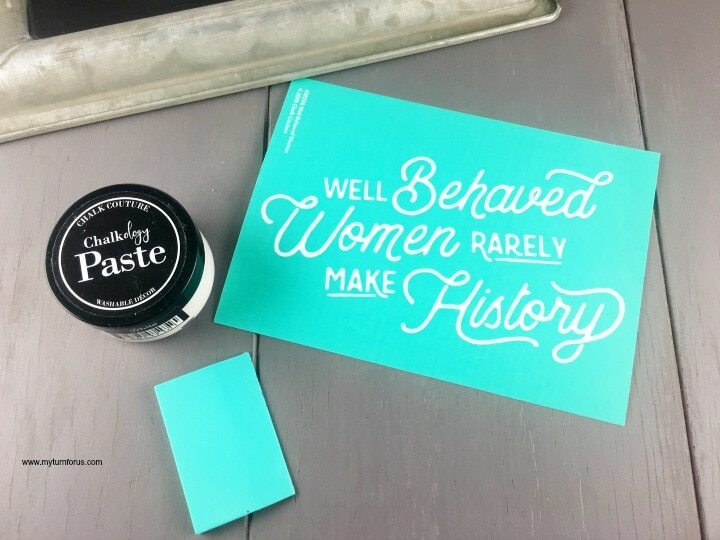 And the Chalk Couture paste is a water-soluble crafting paste. It goes on wet, dries hard and washes off non-porous surfaces with water. So if I tire of one design, it can be wiped away and a new cute sign made in minutes. See how easy it is to change signs? And one doesn’t mind erasing it if it’s so easy in the first place. 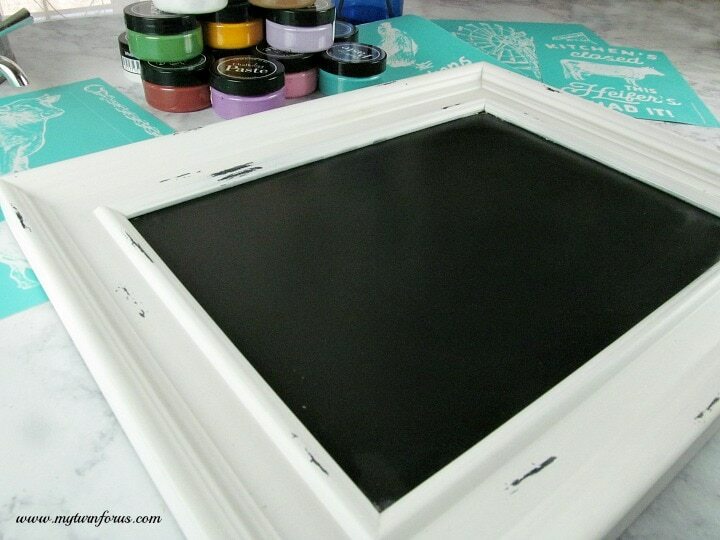 A wet paper towel easily wipes the chalkboard clean and it’s ready for the next creation. 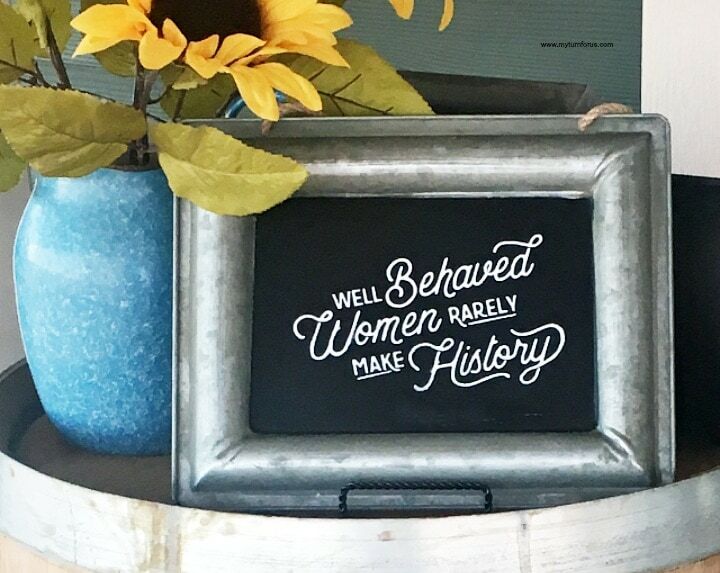 See, now we can make a new sign on this chalkboard. Chalk Material and Surfaces (click thru to see) to see all the many different chalkboard signs. 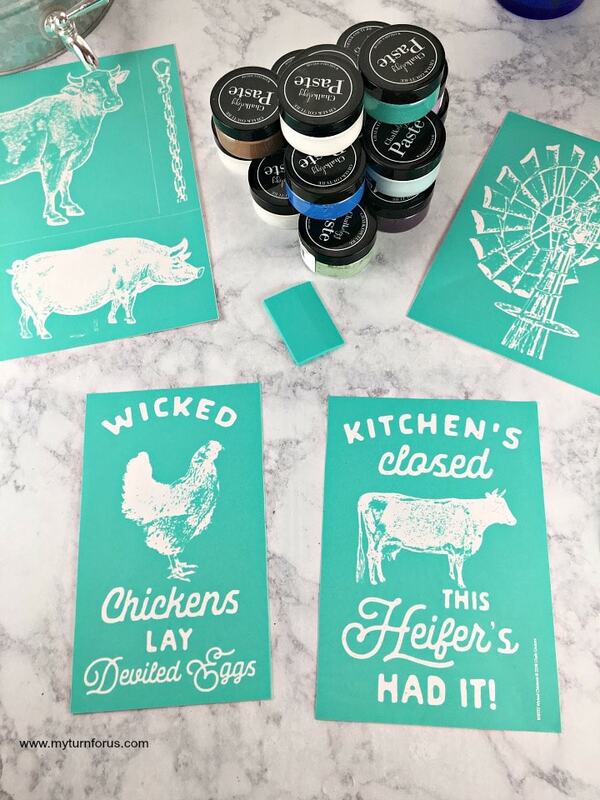 Now which Chalk Couture Chalkboard Stencil should I try next? We hope you enjoyed our post on how to make chalkboard signs and mini chalkboard signs using the best chalk paint. And we hope you have many projects in mind. Please share your creations and comments.